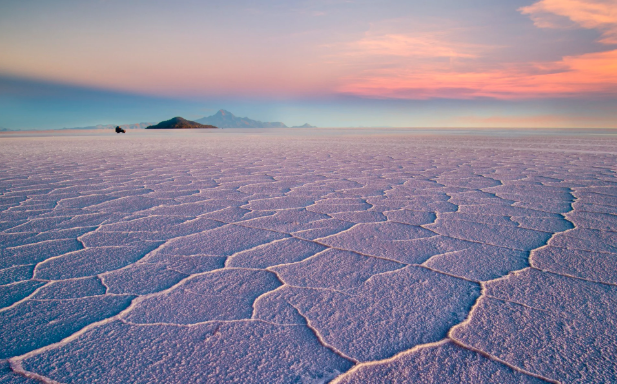 More than 11,000 feet up in the Andes mountains of southwest Bolivia lies Salar de Uyuni, a remote salt flat that is home to some of the world’s largest reserves of lithium. Largely untapped, the seemingly endless expanse of bright white salt plains are on the verge of a frenzy of activity as a global scramble erupts to extract the metal and secure supplies for lithium-ion batteries – a basic building material for the electric vehicle industry. Last month, Germany struck a deal with Bolivia under which YLB, a state-owned chemicals firm, will work alongside German industrial company ACI Systems to produce 40,000 tons of lithium per year in Salar de Uyuni once operations begin in 2022. With the International Energy Agency predicting the number of electric vehicles on the road globally to hit 125m by 2030, the rush for lithium and other battery metals like cobalt is attracting players old and new. 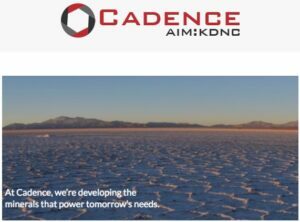 Established player Albemarle is bringing new lithium mines online in Western Australia, while Erik Prince, the founder of US private military contractor Blackwater, has plans to launch a $500m (£392m) fund focused on battery metals. But valuing resources like lithium, which suddenly grab the attention of global investors, is never easy. Prices have proved extraordinarily volatile, plunging 29pc last year from $158 to $111 per kilogram and prompting many to ask: has the lithium bubble already burst? Brian Menell, chief executive of mining specialist TechMet, says it remains a sound long-term bet. “Last year there was a degree of over exuberance in some of these markets including lithium and cobalt that resulted in a bit of speculative hype, and the price ran further than the short term fundamentals justified,” he says. Either way, Menell, who has worked in the mining industry for 25 years, thinks the price correction has been overdone. Since founding TechMet in 2017, he has made battery and technology metals such as lithium, cobalt and nickel his sole focus. They will be “the key ingredients of the tech revolution”, he says. He claims the industry is at a nascent stage but demand for a consistent flow of battery metals in future is inevitable. Demand is set to climb as the car industry and governments globally take action to curb emissions to tackle climate change and poor air quality. Adding an extra geopolitical twist has been China, which has worked doggedly over the past 15 years to secure control over the best resources and the processing of battery metals “while everybody else was sleeping”, according to Menell. The need for Western nations to secure a central role has grown more urgent, he says. By comparison, demand for a metal like copper is expected to increase 2-3pc per year. 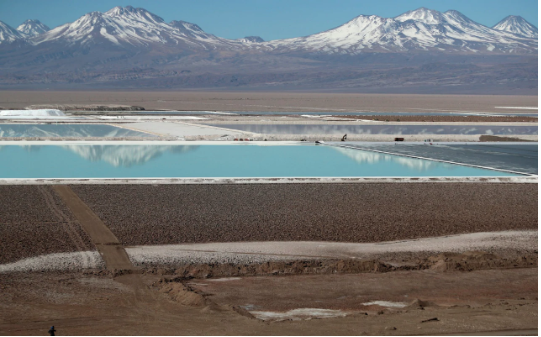 Despite the difficulty extracting lithium from locations such as the Bolivian salt plateau, where heavy rainfall can cause flooding, Menell’s predicts strong demand. “There will be a massive dislocation over the next five, 10 and 15 years between the demand for these metals and the supply which will result in [them] outperforming other commodities by many multiples over that time horizon,” he says. Electric vehicle manufacturers like Tesla rely on lithium as a key resource. Lithium comes from two chief sources: either the mining of a hard rock called spodumene found in places such as Western Australia, or as brine that forms beneath the high altitude salt flats of Chile, Argentina and Bolivia – a trio of countries collectively known as the lithium triangle. Though downward pressure on price is likely to endure for a few years as the market enters a phase of “oversupply”, the metal remains in a favourable position, Jones added. TechMet is looking at hard-rock lithium projects in Africa, rather than brine-based ones such as those in South America. With a current glut of supply, lithium-based batteries look to be the mainstay for the future of the electric vehicle industry. However, not everyone is convinced. Earlier this week, a lawsuit was filed against Elon Musk’s car company Tesla after the death of an 18-year-old passenger in Florida last year was alleged to have been the result of a defective battery, calling into question the safety of lithium-ion technology, which is highly flammable. New technologies are being experimented with too. Flow batteries, which use a metal called vanadium, have emerged as a contender with significant backing from China. Solid state batteries, another alternative, carry reduced risk and have been of particular interest to Sir James Dyson, who is building his own electric vehicle fleet. However, Menell predicts flow batteries being directed more towards grid storage, and attempts to bring new technology to the transportation industry could prove to be very expensive. “In my view, in the next 10-15 years lithium ion batteries will in roughly their present configuration and chemistry dominate for electric vehicles,” he says. And with China keen to clean up its air pollution, output and focus on battery metals and technologies will be greater than ever from the Far East. 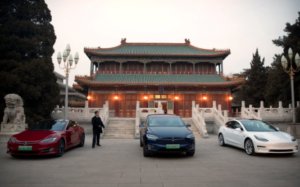 “Although policy targets have been reined in, Chinese regulators still require rapid improvements in the energy density of EV batteries. This will significantly impact the competitive landscape for different battery technologies in the years ahead,” says Jones. Lithium and other battery metals may struggle on price in the short-term, but over the mid to long-term, one thing is clear: the world will eventually need a lot of lithium. The market for energy storage is rapidly gaining momentum around the world. The growing cost-competitiveness of carbon-free energy sources, coupled with improving technology and more environmentally conscious government policies are driving a demand boom for batteries in both the transportation and utility power sectors. But just how big is this boom expected to be? 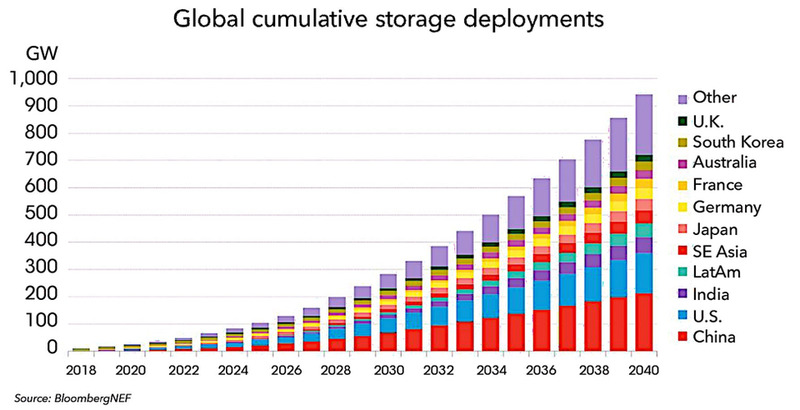 Bloomberg New Energy Finance (BNEF) predicts that the global energy storage market will grow to a cumulative 942GW by 2040, attracting a whopping $620 billion in investments. This makes sense, given that combined wind and solar power generation capacity is expected to eclipse that of natural gas shortly after 2040 – at least according to the International Renewable Energy Agency (IRENA). And those renewable energy stations, which produce power intermittently (the sun is not always shining and the wind is not always blowing), will require adequate storage to make them economically viable. The major players operating in the battery energy storage system market include ABB (Switzerland), LG Chem (South Korea), NEC (Japan), Panasonic (Japan), Samsung SDI (South Korea), AEG Power Solutions (Netherlands), General Electric (US), Hitachi (Japan), Siemens (Germany), and Tesla (US). Keep an eye on these companies as battery deployment and investment continue to rise. The logistics sector has been the first to adopt hydrogen fuel cell electric vehicles as the most efficient way available to decarbonize, but so far that transition has been sparked mainly by the humble forklift. Now it looks like the industry is ready to step up its game into street legal territory, in a big way. Earlier this month Anheuser-Busch announced that it has pre-ordered hundreds of hydrogen fuel cell electric semi trucks — 800, to be exact — from the US startup Nikola Motors. The company is looking at reducing its carbon emissions from logistics by more than 18% through the adoption of 800 hydrogen trucks, helping to meet the company’s 2025 goal of reducing emissions 25% across its value chain. For those of you new to the topic, fuel cells convert hydrogen to electricity through a chemical reaction with oxygen (think H20 and you’re on the right track). Aside from water, there are no emissions from a hydrogen fuel cell electric vehicle. Anheuser-Busch also sees that advantage applying to long haul operations. The company anticipates refilling within 20 minutes, which will reduce idle time. The company also expects a safety advantage due to Nikola’s “surround viewing” design. Hydrogen-electric technology is the future of logistics and we’re proud to be leading the way…By 2028, we anticipate having over 700 hydrogen stations across the USA and Canada. With nearly 9 billion dollars in pre-order reservations, we are building to order, not speculation, and are very excited for what’s to come. 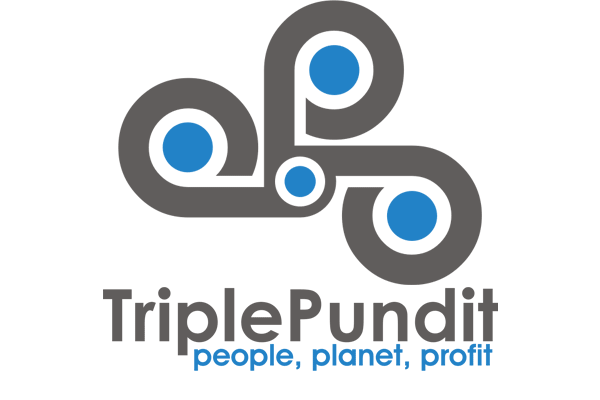 Triple Pundit has been keeping tabs on Nikola since its launch in 2016, and the first thing we noticed was the company’s plans for a network of fueling stations powered by renewable energy. That doesn’t just mean keeping the lights on. Back in 2017, the company envisioned an initial network of 16 fuel stations that produce hydrogen on site, by “splitting” water with an electrical current. With the Anhueser-Busch deal in hand, Nikola has stepped up its plans. The company is now aiming for an additional 28 stations in its network. Although that still may not seem like enough to cover the whole continental US, the truck’s range of up to 1,200 miles cuts down on the need for large numbers. However, Nikola’s 800-truck partnership with Anheuser-Busch finally put the company on the public radar, and it has been making some moves that undercut Tesla where the rubber hits the road. One example is Nikola’s pledge to make its hydrogen fuel station network available to any vehicle. That’s a contrast with the Tesla business model, which makes its battery charging stations available only to Tesla owners. Back in April, Nikola teased news about a forthcoming deal that would enable it to accept pre-orders without requiring a deposit. Nikola also announced that it was refunding all previous deposits on pre-orders while reassuring those customers that they would still retain their position in line. That’s another strike at the heart of Tesla’s business model, which runs into thousands of dollars for deposits on pre-orders. That was just for starters. Nikola plans to leverage its truck refueling network to help kickstart the hydrogen fuel cell vehicle market for passenger cars, which would be in direct competition with Tesla’s battery EVs. It’s certainly not game over for battery EVs, but it looks like the hydrogen economy is going mainstream in a big way now. Lithium is the hottest commodity on the planet right now. It is the most important component of electric vehicles, high-energy batteries, power storage, a vast menu of consumer electronics—and even Nirvana-reaching drugs. Even today’s hyper-growth EV industry is just the tip of the iceberg compared with where it’s headed. Bloomberg New Energy Finance predicts that 35% of all new vehicle sales by 2040 will be EVs, equivalent to 100 million units every year. Tesla’s “halo effect” will make astute investors lifetime riches because that’s 100 times greater than current production. All that growth will present some serious supply chain challenges. But in this massive opportunity, the key to everything is GRADE. Not all lithium is equal. The majors can increase production, but only to a certain degree–and not nearly fast enough to meet growing demand. If you are looking for outsized gains on your lithium investment, you need to expand your horizon to new entrants with high-quality reserves. High-grade lithium producers are where EVERY EV manufacturer will be looking as they seek to keep battery production costs low. Below is a list of the top eight lithium-producing countries in the world. Prices of battery-grade lithium in China, the biggest Li-ion battery producer, surged above $20,000 per tonne in 2016–much higher than the global average. Now, China has traditionally sourced its lithium from Australia, but increasing competition in the EV space and falling prices of EVs has forced it to look elsewhere for cheaper sources. Chile for example mines lithium from brines located just below easily accessible salt flats. The Atacama salt flat in Chile is the source of 37 percent of the world’s entire lithium production. Chinese and Korean investors are already engaged in advanced talks with the Chilean government to open up a huge $2 billion Lithium battery plant to feed on the country’s rich lithium reserves. This could kick off an even more ferocious scramble for the precious metal–especially if China starts hoarding and puts further pressure on already constrained supplies. But with rocketing demand, pressure is on to identify and exploit new resources. Plenty of opportunities exist. Japanese company Hanwa is a cornerstone investor into the Sonora lithium Project in Mexico to supply the fast-growing Asian battery market. And operated by European Metals Holdings, the Cinovec lithium resource in the Czech Republic is expected to become the central lithium supply hub for European EV industry. Low production costs are extremely important for EV manufacturers, now more than ever. Batteries and power trains account for the biggest chunk of EV manufacturing costs. The high cost of these line items is the #1 reason why EVs have remained pricier than they could be. But advancements in battery technology have helped bring costs down–so much so that Tesla can now afford to offer the Model 3 for just $35,000, or half the price of an entry-level Model S.
Near-future demand is so overwhelming that we are in real danger of massive deficits. Current global Lithium-ion cell production can only supply 900,000-1 million electric vehicles. Tesla is on course to kick off production of its first mass-produced vehicle–the Model 3– in July, and has already amassed 373,000 reservations. That’s five times the company’s 2016 sales. Tesla has a goal to produce 500,000 Model 3s per year by the end of 2018, and could hit a million units as early as 2020. The company also sells home and industrial energy products, including Powerwalls. 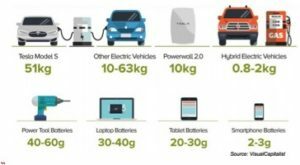 About 51Kg of Lithium goes into each Model S, while each Powerwall 2.0 unit packs 10Kgs of the metal. Global production will ramp up more than 500 percent between 2016 and 2020, and while China will be doing much of the heavy lifting, the emerging resources in USA and Europe will all have a key role to play too. By 2025, the battery market alone will be twice as big as today’s entire lithium market. Therein, of course, lies the massive opportunity. Investors will want to identify owner / operator companies, and investment vehicles involved in a spread of risk – ranging from early stage resources to assets close to / in production. Time is of the essence though: these heady growth projections will be mirrored in stock price gains. 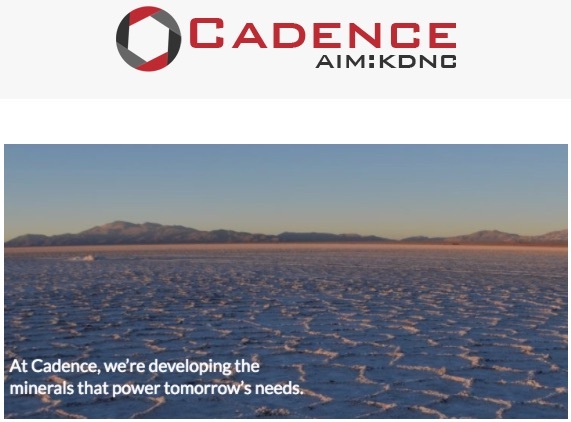 Cadence Minerals (KDNC.L) is a unique early investment strategy & development firm, within the mineral resource sector. We identify undervalued assets, with irreplaceable strategic advantages. We invest in them and help turn them into powerhouses. Lithium and other technology minerals must get to market in order to achieve the global green revolution. We uncover new ways and places to extract and process these minerals, so that burgeoning demand is met; and our tomorrow is better.